Klein Sun Gallery is pleased to present Zhang Gong’s second solo exhibition at the gallery. Zhang Gong was fascinated with New York City on his first visit which was his debut at Eli Klein Fine Art; he became inspired to portray this metropolis as a counterpart to his Beijing cityscapes. Beijing - New York showcases Zhang Gong’s new acrylic on canvas paintings of these two cities. New York’s energy is expressively encapsulated with streets congested with traffic, rows of windows packed together, and spindly skyscrapers reaching up to the sky. Zhang Gong’s vision of New York, a panorama pieced together from pre-existing buildings and embellished with cartoon characters, has the visual effect of a chess game where all the pieces have rebelled against their grids and are now strewn across the board. While New York is portrayed through the eyes of a visitor, Beijing is depicted with the familiarity of a lifelong resident. In Beijing No. 1, the artist replaces historic imperial buildings with mundane offices and apartment buildings, each of them painstakingly detailed. Only the most prominent structures of day to day life are depicted, highlighting Beijing’s modernization. Close attention reveals that the cartoons which were characteristic of Zhang Gong’s earlier work now take a backseat to the prominence of the rows of looming buildings. His latest work gives way to a new theme where abstract form supersedes narrative, and definitive interpretation has given way to mere suggestion. Zhang Gong received his Master of Fine Arts from the Central Academy of Arts and Design in Beijing and is currently a Professor in the Department of Information at Tsinghua University. Zhang Gong’s works have been exhibited at the Kunstmuseum in Bonn, Germany, the Singapore Art Museum, and at the Museum of Contemporary Art in Shanghai. Zhang Gong’s animations have been selected for prestigious international film festivals throughout Asia, Europe, the United States, Australia, and Latin America. 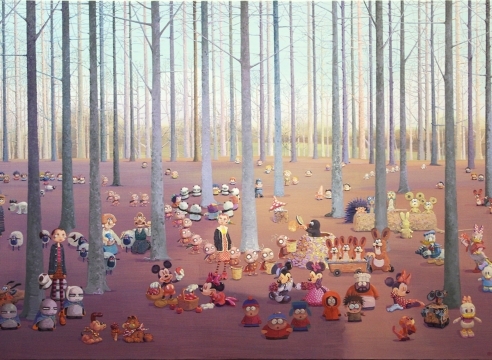 The exhibition will be on view at Eli Klein Fine Art from March 3rd through March 31st, 2011 and is accompanied by a fully illustrated catalogue with an essay by Liu Ye. The artist will be present for the opening reception on Thursday, March 3rd from 6 - 9 PM.